The Jamaica Bay Greenway is a planned 28-mile network of pedestrian and bicycle paths connecting communities along the Jamaica Bay waterfront to more than 10,000 acres of city, state and federal parkland, including Rockaway Beach, Marine Park, Canarsie Pier, Floyd Bennett Field and the Jamaica Bay Wildlife Refuge. More than 10 miles of the Greenway already exist, serving roughly 100,000 local and regional visitors annually. When completed, multi-use paths and on-street bicycle markings will create a loop route around Jamaica Bay, allowing cyclists and walkers to commute, exercise and explore the Bay’s natural beauty from Sheepshead Bay and Spring Creek in Brooklyn to Howard Beach and the Rockaway Peninsula in Queens. 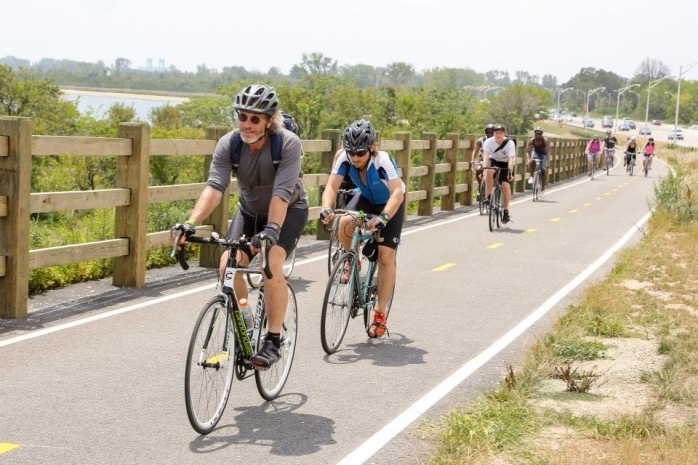 As the City and the National Park Service continue to invest in Jamaica Bay as a recreational destination and an economic driver for South Brooklyn and Queens, a cohesive, user-friendly greenway network is a critical resource for accessing all the Bay has to offer. DOT has committed to growing the network of pedestrian, bicycle, and greenway facilities throughout the City. Over 380 miles of protected paths and lanes have been built, many of which connect more than 60 miles of planned or completed waterfront public spaces. Greenways provide a safe, convenient, and fun space for active recreation and non-motorized transportation. The completion of the Jamaica Bay Greenway is an important component of an interconnected Brooklyn-Queens waterfront greenway network.